The French Don’t Diet Plan: 10 Simple Steps to Stay Thin for Life is written by Dr. Will Clower, an award-winning author with a PhD in neuroscience. He promises that by following the suggestions in this version of the French diet you will lose weight while truly enjoying your meals by eating “real” food, instead of the processed food that is such a large component of the diets of Americans. Clower says that the French don’t eat processed foods, don’t avoid carbs or fats and don’t take nutritional supplements. They enjoy wine at lunch and dinner as well as leisurely meals. These habits, he claims, result in a reduced rate of obesity in comparison to that of Americans. In this French diet Plan you can eat anything you like so long as it is what he refers to as “real” food – food that is unprocessed and found in nature. Cheese, butter, bread, chocolate and wine are all allowed in moderation. You will learn to eat smaller portions and make meal times last longer by eating more slowly. In this phase you don’t change how much food you are eating but rather learn how to create more balanced meals. High glycemic foods are not permitted. Once you have achieved your target weight you can increase the variety of foods you eat and may also include high glycemic foods. This French diet also includes over fifty easy gourmet recipes including items such as Banana Nut Pancakes, French Onion Soup, Braised Orange Chicken, Creamy Alfredo Sauce and a variety of desserts. While sample menus are not provided Clower offers general suggestions for breakfast, lunch and dinner as well as ideas for eating in restaurants or when time is limited. Whole grain bread, pasta, rice, oatmeal, eggs, yogurt, butter, cheese, fish, chicken, lean pork, fruit, vegetables, beans, dark chocolate, olive oil, red wine. According to Clower you don’t need to engage in structured exercise to lose weight and less is more when it comes to exercise. In his French diet, he encourages readers to mimic the lifestyles of the French who spend a lot of time walking everywhere. 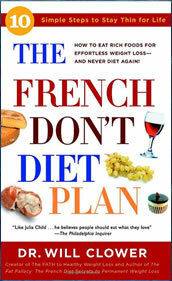 The French Don’t Diet Plan: 10 Simple Steps to Stay Thin for Life retails at $13.95. Dieters can enjoy their favorite foods. The French diet does not require calorie counting. Educates dieters about portion control. May assist with the management of diabetes and high cholesterol. Allows for the inclusion of wine and other treats in moderation. New research suggests that at the current rate the French could be as obese as Americans by 2020. May take some time for results to become apparent. This French diet does not encourage exercise. Will require more time to be spent shopping and cooking meals. Does not include a detailed meal plan. The recommendations put forward in This version of the French diet involve solid and commonsense advice, where dieters are encouraged to eat fresh, unprocessed foods, consume smaller portions and increase their daily activity. While it may take some time for results to become apparent these dietary and lifestyle adjustments recommended by this French diet if followed consistently will most likely lead to weight loss and improved health over the long term.